Politicians inspected the future of their parties as they visited DCU’s ‘Clubs and Socs’ signups on Monday. 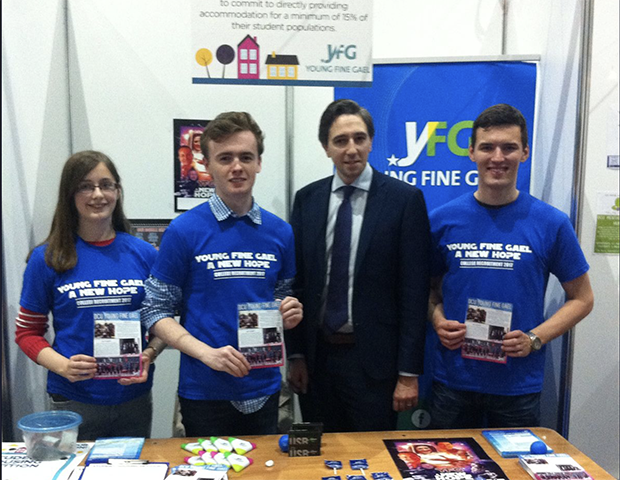 Among the familiar faces was Fine Gael Minister for Health Simon Harris who made his way around to greet other societies after posing in pictures with DCU’s Young Fine Gael branch. “I am very encouraged to see clubs like the Mental Health Society and see the work they’re doing. Obviously as Minister for Health it was really good to see people working so hard for students, particularly around stressful times like exams”, said Harris. Harris regretted he could not meet with DCU’s Amnesty society as they were cleaning up their stall by the time he got there. “I know Amnesty are campaigning for a referendum on repealing the 8th. I personally am in favour of repealing the 8th and the government are committed to trying to hold a referendum on the issue next year. I know it’s an issue many students here are interested in”, commented Harris. Fine Gael TD Richard Bruton and Fianna Fáil TD Sean Haughey, as well as Sinn Féin’s Councillors Paul Donnelly and Noeleen Reilly, Dessie Ellis TD and Lord Mayor of Dublin Mícheál MacDonncha also made an appearance and talked with their DCU representatives. ‘Clubs and Socs’ magnified the political presence in the university. Heated competition was evident between the political groups in DCU. Fianna Fail compared An Taoiseach Leo Varadkar to the menacing Night King character from the Game of Thrones on a poster and DCU Sinn Féin Republican Youth refer to Fine Gael as ‘The Blueshirts’. The political atmosphere does not seem to end with political party groups however. “The Feminist society for example is inherently political, Conradh na Gaeile and An Dream Dearg have undeniably shown how in the occupied six counties how simple cultural expression can be a powerful political statement”, said Eoin de Rosfort from DCU Sinn Féin. Senator Aodhán Ó Ríordáin planned to stop by, however was unfortunately unable to make it due to another engagement but is expected to visit the college soon according to DCU Labour Youth.